When you pick up a Czech glass Druk bead—versus any round bead you buy at a craft store, you can feel its quality. The form is solid, with colors that run deep through the glass. Edges are smoothed, and coatings are fused to the bead. The craftsmanship is unmistakable. Etched Druks have a little something extra. When you first see their texture and stippled glow, you think you are looking at a stone or matte porcelain bead. You want to reach out and touch them, lift them up to the light. They have a misty—if not mystical—appearance, especially in the light of the sun. 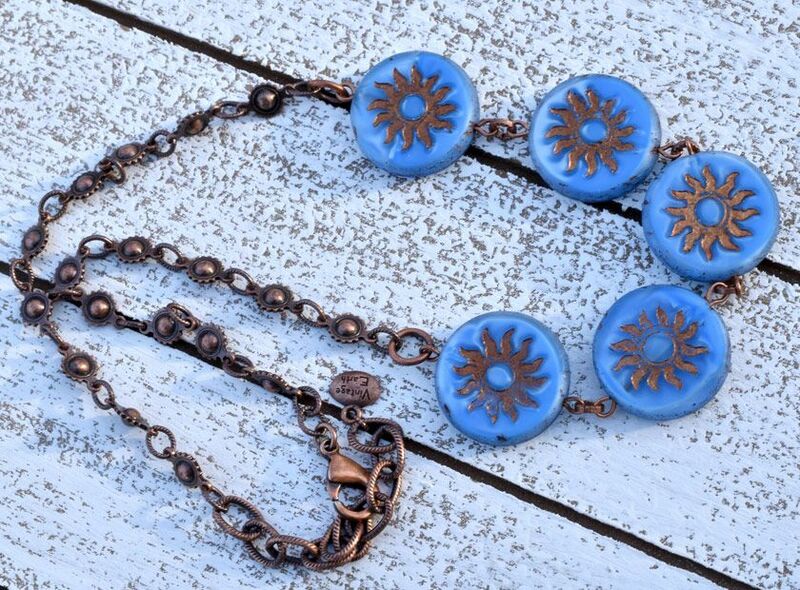 Nirvana’s etched glass Druk beads are the perfect fit for designer Stacie Reed’s jewelry. Her multi-strand bracelet features mixed Druk strands in assorted blues. The deep sapphire etched rounds have a Picasso finish washed with gold; the slate blue rounds are Picasso with turquoise. The etched surface holds the finish and highlights these gorgeous patinas. Stacie has paired the stunning beads with fire polished rondelles in a deep topaz color. The ornate antiqued brass clasp ties it all together into a multi-layered, elegant Bohemian look. Czech glass Druks are a staple for any jewelry designer. With their classic round shape, they are the perfect bead for contemporary or vintage styles. Etched Druks are an especially unique bead essential that can add organic texture and richness to any design. They truly feel like beads from an ancient time. Born in the Bohemia region of the Czech Republic, Druk beads date back over 300 years. The word Druk, from the German Druck, translates to “pressure,” and refers to the pressed glass manufacturing process. Druks are the most basic form of pressed beads, and are the foundation from which other beads, such as fire polished rounds, are made. Many artisans still produce the beads by hand, and the process hasn’t changed much in centuries. Molten glass is formed into rods and pressed into molds, and a needle is inserted to create the bead hole. The rounds are cooled and placed into a tumbling cycle that smooths and polishes the beads. 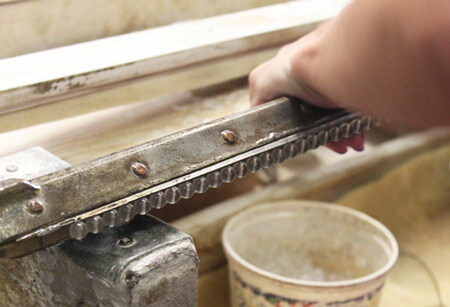 Before a finish is applied, the beads are reheated to ensure the coating properly adheres. The etching process isn’t so much a coating as it is an engraving. Sometimes referred to as acid- engraving, the beads are dipped into a solution that meticulously scores away at the material to create a matte, textured finish. 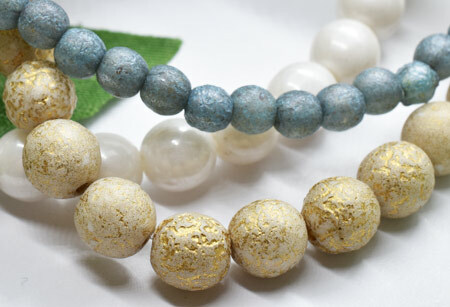 The result is a stone-like appearance that gives the beads an organic appearance and ancient feel. Stacie’s lovely bracelet is just one of the many designs she has created using Nirvana Beads. Her jewelry brand, DeZigns for Life, was created out of her desire to give back to those in need. She took the time to answer a few questions about her business, designs and inspiration. What’s your background, and when did you first discover your love for jewelry design? I have a background in retail merchandising, homeschooling, and have a love for nature. I have always loved art and being creative. My mother, who is also very creative, taught me to knit and crochet about five years ago. I loved it so much and made so many different items that I began to sell to friends. Upon suggestions from friends, I took them to a market and had a really good response. My sister visited the booth and wanted to find something we could do together to take to a vintage market. At the time she had purchased a wrap bracelet and it caught my eye. I set my mind to learning how to make one for myself. I so loved the challenge and the variety of beads available that soon I was making wrap after wrap. That lead to other styles, and within a couple of months, my sister and I had enough inventory to get a booth in a vintage market. We had so many positive interactions with customers that it fueled my love for finding beautiful stones and designing nature inspired pieces. I am going on three and a half years and have loved every minute of it. Tell us a little about your company, DeZigns for Life, and how you came to sell your work. DeZigns for Life began with a dream of being a part of something bigger than ourselves. My husband and I decided that everything that was designed and sold, we would bless others by giving back ten percent of profits to the community. Our hearts landed on an adoption ministry called Legacy 685 because we have many friends who have adopted or are going through the adoption process. We consider it a privilege to be a small part of such a life-giving ministry. What inspires your creativity and jewelry designs? All things of nature are my inspiration. I am particularly passionate about the mountains, even though I have lived in Houston most of my life. I love the ruggedness of the mountains and the peacefulness of the valleys. Therefore, a lot of my color choices reflect colors you would find there, very subdued and monochromatic. I often peruse other designers to help with technique since I am so new. Then I incorporate my favorite natural stones and leather into my pieces. When creating the etched Druk bead bracelet, what inspired the design? Tell us a little about your process. I found a seven-hole brass locket clasp at Nirvana Beads about six months ago. I love using slightly different colors and textures of stones that complement each other and provide a stacked look with only one clasp. I chose the Druks because of their natural color and the texture of the beads. Different sizes and shapes add a lot of interest to me. What are your favorite Nirvana beads and colors to use in your designs? My favorite Nirvana beads are the rondelles and the fire polished beads in different shapes and sizes because they are so versatile. I have made many wraps with the 3x5mm natural blue and brown hues, hand knotted necklaces with the 5x7mm and 6x8mm rondelles in the picasso blues and browns, and stacked bracelets with a mixture of picasso blues, browns, and creams. My absolute favorite thing from Nirvana is the beads using the Picasso finish. I feel it gives the beads a vintage and rugged look, which fit nicely into my designs. Is there any advice you can give to aspiring jewelry designers? Follow your passion. Don’t try to be someone you are not. Show off what you design. There will be good designs and bad; it is okay. Take classes to create an excellent good quality piece. Incorporate social media. Love what you do and do what you love! Elegant Bohemian. This is what Stacie’s bracelet brings to mind, and the etched Druk beads add a unique element to it. The secret ingredient is the texture—a stone-like feel that transports any design to another place and time. Suddenly a simple piece of jewelry has an ancient feel and artisan soul, and has been transformed into a work of art. The etched beads in Stacie’s bracelet are available in several colors and finishes that are perfect for spring and summer designs. To see her other designs, visit her Etsy page.